The health effects of tobacco are widely known, which is why medical professionals encourage quiting, sooner rather than later. But it's the impact of smoking on children ages 18 and younger that causes the most concern. In fact, one study found that if young people smoke while in high school, they are more likely to drop out of high school at higher rates than teens who use alcohol or drugs. California has led the country in setting up smoking bans, including one legislation that taxes cigarettes. The bill directs part of the proceeds to go toward school-based health education programs to prevent and reduce tobacco use. When this public health initiative took effect, many California school districts saw huge drops in teen smoking. For instance, Los Angeles, which has the second largest school district in the United States, saw teen smoking rates decline from 27 percent in 1997 to 9 percent in 2001. In California, school districts that want the distinction of being certified "tobacco-free" must have signs stating, "Tobacco Use Is Prohibited At All Times" at every vehicle and pedestrian entrance to every property owned by the school district. Unfortunately, their budgets and academic priorities can't always cover the purchase of these signs. In Los Angeles (LA), the LA County Office of Education (LACOE), buys the signage and distributes them to school districts. "I switched to Metalphoto®...signs. They have a longer outdoor lifespan and aren't damaged by the solvents we use to remove graffiti paint." LACOE, which administers an annual budget of $652 million to promote academic achievement and fiscal stability for the county's 80 K-12 public school districts and two million preschool and school-age children, is able to pool resources and take advantage of economies of scale. While most of the money in the budget is used for classroom instruction and a variety of cost-saving educational programs and business services for school districts, teaching kids about and keeping them tobacco free is one of the efforts they support. "The costs to purchase signage can be a real hardship to some of the districts and schools we work with," says Glenn Dodd, LACOE tobacco use prevention coordinator. Even with the signs and tobacco prevention work being done in LA County, keeping kids away from smoking is a major undertaking. The tobacco industry has found multiple ways to circumvent various advertising restrictions and is able to get its messages in front of middle and high school students. According to a Centers for Disease Control (CDC) study, students are exposed to ads through the Internet, in magazines and in stores. "Metalphoto of Cincinnati has a competitive price and an excellent product." According to CDC statistics on youth smoking, adolescence is when 9 out of 10 smokers first try and become addicted to smoking. If a young person can stay smoke-free until age 21, the likelihood of ever starting smoking is reduced. 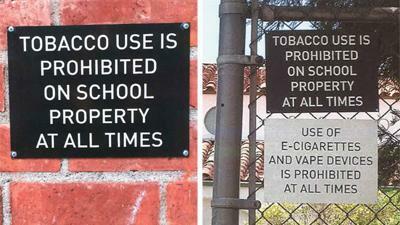 Six years ago, LACOE began buying tobacco-free signs. Initially, they purchased aluminum signage with a vinyl coating, which were estimated to last five years. "These didn't look all that great," Dodd says. "Plus, many of them got spray painted and graffitied. They couldn't withstand the solvents we used to remove the spray paint. "I went online to find another option, and after some research, I switched to Metalphoto aluminum signs," he says. "They have a longer outdoor lifespan and aren't damaged by the solvents we use to remove graffiti paint." Metalphoto anodized aluminum has proven outdoor durability of more than 20 years. "Metalphoto of Cincinnati has a competitive price and an excellent product," he says. "Plus, they're convenient and easy to use. I contact MPC and give them the verbiage. They create a nice clean font, print it on the signs and send it to us."